Last week (on March 26th) Mr. Peter Tabuns, the Ontario NDP’s Environment and Climate Change Critic, introduced Bill 21, the Liability for Climate-related Harms Act, 2018 into the Ontario Legislature. In doing so, he stands with the growing number of Canadians who believe the growing costs of climate change cannot be simply left to taxpayers and ordinary citizens to pay, but that the companies that have benefited from selling fossil fuels need to pay a fair share of those costs. 2 ½ years ago, at the Paris Climate Talks, West Coast Environmental Law and the Vanuatu Environmental Law Association held a press conference releasing Taking Climate Justice into our own Hands, a report that proposed that climate compensation laws – laws that make it easier to sue fossil fuel polluters – could play a major role in fighting climate change. 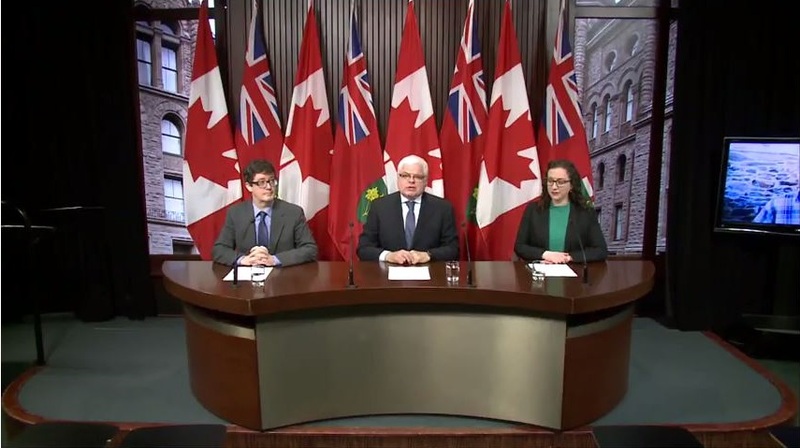 After the press conference, Peter Tabuns, the Environment and Climate Change critic for the Ontario New Democratic Party, came up and introduced himself, and expressed interest in introducing such a law in Ontario. A few months back, Mr. Tabuns contacted me to indicate that he was planning to introduce a bill, and inviting feedback on a draft. It has been a privilege to be able to give comments and suggestions to Mr. Tabuns, and to see the Bill introduced into the Ontario Legislature. Climate change is real. It is already affecting Ontarians’ lives as increased wildfires and flooding create significant and costly damage. Climate change threatens to make life more expensive as people and governments are required to pay for the harm it causes and for the protection of schools, roads, hospitals and homes from unprecedented flooding and other extreme weather events. Enhanced legal tools are required so that governments, businesses and individuals can ensure that coal, oil and gas producers contribute their fair share to paying for the harms to which their products contribute and for the necessary steps to prevent future harms. Bill 21 is much simpler than the model legislation West Coast proposed at our Paris press conference. Where we proposed legislation that clarified how existing legal principles might apply to climate litigation, Bill 21 is in some ways bolder – simply asserting that fossil fuel producers, once their contribution to climate change is over a certain size, shall be “strictly liable” for climate-related harms occurring in Ontario. “Strict liability” means that fossil fuel producers could be liable for the costs of climate change without proof that they acted negligently or intended to harm anyone. Given that the companies profited financially from their products and (at least from the 1950s) knew that they would cause climate change, Mr. Tabuns’ bill can be seen as an application of the polluter pays principle. sets a threshold for liability – when the emissions from a corporation reach a “globally detectable level.” We often hear that if fossil fuel companies can be sued for climate change then individual consumers and drivers could be sued. That’s ridiculous – the emissions of individual drivers are not detectable at a global level. The emissions of Chevron and the other carbon majors are globally detectable, and that’s who Bill 21 targets. Clarifies rules of proof for connecting particular weather events to climate change, including confirming that events that have become more than twice as likely as a result of climate change may be considered to have been caused by climate change. Actual [reductions] of carbon emissions and justice for young people will only occur when fossil fuel companies must pay for costs of climate change so that they have the incentive to become clean energy companies. We have applauded Bill 21 and called on the BC government to consider similar legislation. However, do we need legislation to hold fossil fuel companies accountable for climate costs? After all, in my opinion (after years of research) fossil fuel companies can already be sued for nuisance under existing Canadian legal principles. In the U.S. several communities are already suing fossil fuel companies and in Canada, West Coast Environmental Law and more than 60 other BC-based organizations have called on local governments to bring a class action lawsuit to recover their costs of preparing for climate change. So why are Bill 21 and other climate compensation laws so important if lawsuits are already possible? Resolving uncertainty, with minimum expense – First, while (in our opinion) lawsuits are already possible under existing law, not everyone agrees. Litigation to sort out those key legal questions are going to be time consuming and expensive, which favours parties that want delay and have deep pockets (ie. fossil fuel companies). Clarifying key legal questions through legislation is fairer, quicker and may be faster in terms of sending an economic message to the fossil fuel companies and their investors. Expanding liability – Climate lawsuits by governments for adaptation costs are possible under existing legal principles. But that doesn’t mean that existing legal principles might not reduce the amount of compensation that can be recovered in those cases or exclude certain types of claims altogether. Bill 21 clarifies that fossil fuel companies are strictly liable simply for having sold the products that caused climate change. That expands the potential liability of the fossil fuel companies considerably and might open the door for claims that would have been difficult under existing laws. Public discourse – Parliaments and legislatures are where a democratic society debates key issues and grapples with important topics. Ordinary members of the public can talk about court cases, but they can’t press judges to adopt laws in the way that they can demand action from their elected representatives. Legislation is an important way to have a debate about whether taxpayers or fossil fuel companies should be paying for climate costs – and how much each should pay. It is important to understand that Bill 21 is a private members bill introduced by an opposition Member of Provincial Parliament. What this means is that Peter Tabuns’ bill, in its current form, is unlikely to pass and become law. However, by forcing the Ontario Legislature to debate the Bill, Tabuns is putting front and center the question of who will pay for climate change, and forcing all the parties in the Legislature to confront that issue. And he’s provided a model for legislators elsewhere who might be looking for new approaches to climate leadership. [T]he introduction of Bill 21 reflects a bellwether for future efforts by government to impose liability for climate change-related harms on companies engaged in fossil fuel production. For companies involved in oil and gas production in Canada, this bill reinforces the importance of taking adequate steps to plan and prepare for future climate change litigation. Where will the next Climate Compensation Act be proposed? And where and when will the first one be passed?